LinkedIn groups are for professionals in the same industry or with similar interests to dialogue, share information, learn from each other, establish themselves as subject matter experts, and much more. Group members can share experiences, business knowledge, interests, and ideas with a broad variety of individuals from around the world. According to LinkedIn, there are more than two million groups on its platform, covering a variety of topics and different industries — from start-ups to manufacturing to plumbing and much more. You are only allowed to be a member of 50 LinkedIn groups. While that may sound like quite a bit, think about the benefits of being in an unlimited number of groups. Even if you are not involved in the ongoing discussions, groups provide the ability to send direct messages to fellow group members, the ability to help your search rankings within LinkedIn, and to be found within groups. If LinkedIn gave me the option to join 100 groups, I would do it. Here are some statistics from LinkedIn concerning groups. People who post or engage in group discussions get an average of four times as many profile views. More than 8,000 LinkedIn groups are created every week. More than 200 group conversations occur each minute. On average, members join seven groups — whether it’s for professional or personal growth. When you are a member of a LinkedIn group you can participate in business discussions and promote your own products, events, and services. You can also engage in much simpler activities, such as liking a discussion, commenting, and sharing posts by other group members to your network. If you promote your business too much, the group moderator, who sets the rules, may remove you as a member. You have to use good judgment to not overdo how you promote your business. Many groups have a “Promotions” link in the Group’s navigation. The person who created the group is typically the moderator and can open the group to all LinkedIn members or make the Group private. The moderator can also approve all posts. The process of engaging in LinkedIn groups does require some planning and commitment, for daily activity. The groups you decide to become a member of may be industry and associations. Industry groups may help establish you as an expert. Groups related to your business provide an opportunity to test your knowledge and receive feedback. Members of these groups can include prospective customers. For those groups, you may want to comment on other postings instead of starting a new discussion, to stay clear of any promotions and have your comments withdrawn by the moderator. If you travel for your business, you can find LinkedIn Groups related to specific locations as potential sources to learn more about the area, find partner companies, or even learn about upcoming networking events. When you search for a group based on a business, industry, or association term, the results will show you the total of number groups associated with that term. They are sorted by those with the most number of members, the number of active discussions, and how many people from your network are engaged in the group. A good group does necessarily mean it has to have a lot of members. While groups with many members can help you get your name out to many people, you may find better quality with smaller number of members. I’m not sure there is a wrong answer. You have to start by joining a variety of groups to test what works best for you. You can click on a group in the search results to evaluate it further. To join the group, click the yellow “Join” button. Click on the “i” at the top right of the group page to learn more about the group. Click on the number of members on the group page to see individual profiles. You can search for individuals or for the companies they work with, and, importantly, ask to connect with them through the groups. Sample LinkedIn group page — before joining. Once you have clicked on the yellow “Join” button, you may be active immediately or the moderator will approve you first — depending upon the rules of the group. If the group requires moderator approval, you will be notified by email when you have been approved. After you join a group, the top right heading will change from “Join” to “Member,” as shown below. Many entrepreneurs would rather spend advertising dollars to get in front of prospects, as it is less time consuming than participating in a LinkedIn group. However, advertising can be expensive and it does not necessarily establish your expertise. To this end, LinkedIn groups fall into the category of “marketing” and not “advertising,” meaning participation will take some about, perhaps 15 minutes each day. Here are a few points to succeed in LinkedIn groups. Read the group rules and abide by them. Introduce yourself to the group, which is something many groups allow. Be an active participant. Share something either with a question to the group, comment on other postings, follow members, or send out LinkedIn connection invites to engage with others in the group. Use the group’s promotions section to promote your business with specific topics. Follow active members of the groups and invite them to connect with you. 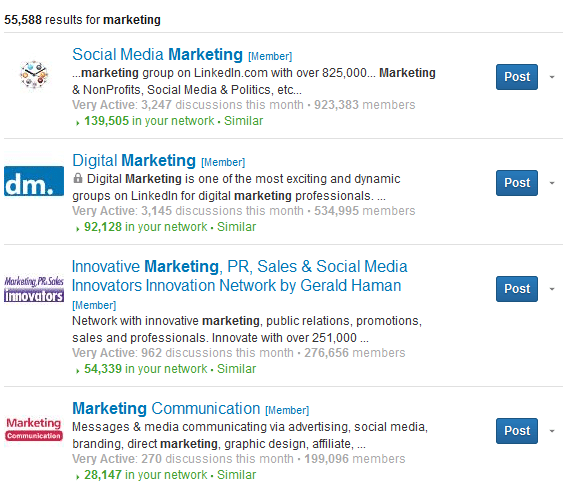 Your results from participating in LinkedIn groups will differ based on a variety of factors. Some may not have anything to do with your engagement level. The group moderator can be directly involved in the success or failure of a group, just as much as the group members. I invite you to share your experiences or ask questions about LinkedIn groups, in the comments below.